The purpose of our Adults Ministry is to encourage people to become followers of Jesus who seek to know Him, share life together, and serve the body of Christ locally, regionally, and globally. We believe God has gifted each of us and intends for us to use those gifts within the context of our church family ministry. We all have a place to belong, a place to serve and a place to make a difference. Come join our adult Lifegroups and Discipleship classes. You will find your place within the church family and will grow in personal relationships while growing in your personal walk with the Lord. Life is better when we do it together with people who care. Joining a Lifegroup is the first step to getting connected at Town Creek. These co-ed small groups meet on Sunday mornings from 9-10am and are specifically designed to foster community through bible study, fellowship and prayer. We currently study lessons that pair with the ongoing sermon series. This usually involves a verse by verse study and discussion of a book of the Bible. Each week we dive into various topics and strive to understand the Biblical context and application to our lives. We have a class where everyone can relate – from college students to senior adults, from new parents to empty nesters. Classes are grouped by age with married and single together in the same class. Our greeters will be able to show you to and introduce you to the class that best fits your stage of life. We also offer a variety of both co-ed and single-gender intentional discipleship courses throughout the year. These short-term bible study groups will equip you to grow deeper in your walk with the Lord. Regular adult discipleship times are Sundays at 5pm and Wednesdays at 6pm but additional home groups and studies occur throughout the week. Currently we are corporately going through Tell Someone during on Sunday, Wednesday and Home Groups. 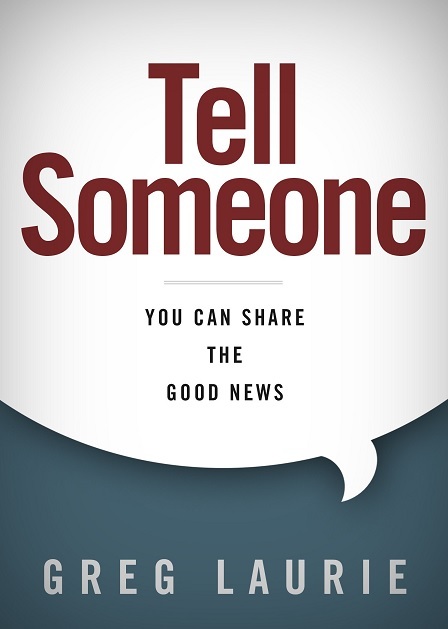 This is a 7-week study that helps group members identify people and places already in their daily routines, encouraging and empowering them to share the good news of Jesus Christ. Evangelism shouldn't be an artificial religious sales pitch. We shouldn't be afraid of burning bridges with people we know and love. Instead, we should build bridges with our stories to connect people to the heart of the Savior. This refreshing look at evangelism from one of the nation's most prominent pastors and evangelists, Greg Laurie, will help Christians—new and old alike—discover the joy of evangelism as the good news of Jesus naturally overflows into their daily lives.